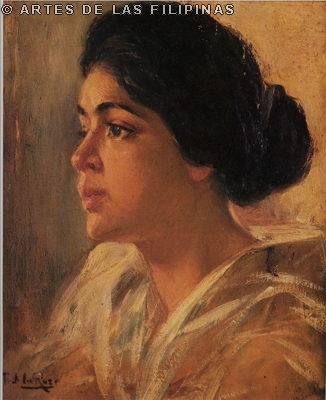 Fabian de la Rosa (May 5, 1869- December 14, 1937) was the brightest name in Philippine painting after Luna and certainly the leading master of genre in the first quarter of the century. Particularly noted for being an outstanding painter of women’s portraits, alongside Juan Luna and his nephews, Pablo and Fernando Amorsolo. Fabian Cueto de la Rosa was born on May 5, 1869 in Paco, Manila, the second child of Marcos de la Rosa and Gregoria Cueto. He had apprenticed with his aunt, Mariana de la Rosa, and later with Simon Flores for his first art lessons. 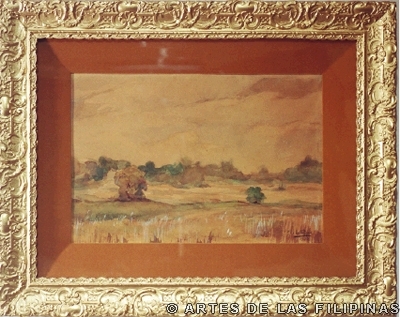 Prior to receiving any formal academic training in the arts, he painted La Perla de Lucban, his first known masterpiece and oldest existing work, at the age of twenty-two. 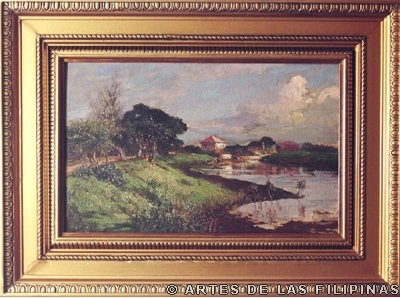 In 1893, he enrolled in Escuela Superior de Pintura, Grabado y Escultura under the directorship of Don Lorenzo Rocha (1837-1898). He left the Academy and frequented studios of simple unknown painters in Quiapo and Sta. Cruz, Manila to look for new ways to forge his ideas. Later on, he also received lessons from Lorenzo Guerrero and Miguel Zaragoza. De la Rosa spearheaded the student body in petitioning the government to hold the quadrennial contest for the pensionado-ship to the Madrid Art Academy in June of 1896.The petition was approved by the authorities but the outbreak of the Revolution impede its implementation for the next two years. In April 1898, the Second Revolution was on the brink of exploding so the contest was considered an exercise in futility. Despite of this, de la Rosa won the scholarship just when the Spanish regime was nearing collapse. On January 13, 1900, he welcomed the 20th century by marrying Gorgonia Tolentino. Although the couple was childless, their house was filled with the presence of their orphaned nephews, Pablo and Fernando Amorsolo, who stayed with them in 1903. In 1904, de la Rosa won his first gold medal for Planting Rice, in the St. Louis Exposition. Four years later, in 1908, when the University of the Philippines School of Fine Arts was founded, de la Rosa received a scholarship from the Germinal Cigar Factory to study in Europe as a scholar. He attended the Academie de Julien in Paris and the Academia de Bellas Artes de San Fernando in Madrid -- the school attended by Juan Luna, Felix Resurrecion Hidalgo, and later on Fernando Amorsolo. When he returned to the Philippines in 1910, he joined the distinguished faculty of the UP School of Fine Arts which consisted of outstanding alumni, scholars, and professors of the old academy: Don Rafael Enriquez (1850-1927), the first director of the School of Fine Arts; Jose Asuncion (1869-1925), Teodoro Buenaventura, Vicente Francisco (sculptor, 1866-1936), Antonio Garcia (engraver), Joaquin Ma. Herrer,Vicente Rivera and Miguel Zaragoza. De la Rosa introduced and taught decorative painting. Teaching and portrait painting became his means of livelihood. 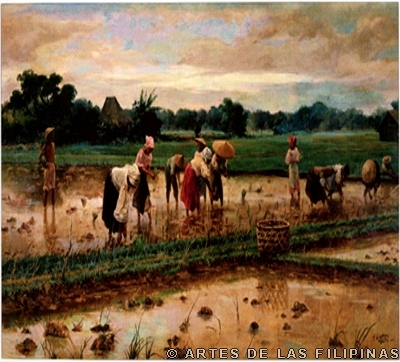 His skill and reputation in portraiture have rarely been equaled except perhaps by Fernando Amorsolo. 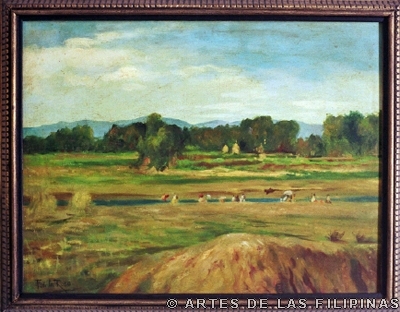 During the period of 1927-1937, upon the retirement of Rafael Enriquez, de la Rosa became the director of the UP School of Fine Arts with a new set of upcoming masters: Fernando Amorsolo (1892-1972), his nephew and pupil, Fernando’s brother, Pablo (1898-1945), Dr. Toribio Herrera (1892-1968), Ireneo Miranda (1896-1964), Ambrosio Morales (engraver) and Guillermo Tolentino (sculptor, 1890-1976). In 1928, de la Rosa went to tour Europe with his wife the second time. He painted in Paris for four months and then traveled to Munich, Geneva, Rome, and Madrid. In 1928 he presented a much-acclaimed exhibition of his paintings at the Ateneo de Madrid. Best remembered for painting landscapes, portraits, and everyday scenes with women depicted as simple yet regal in doing daily activities such as cleaning out clay pots, weaving, chatting, going to church, planting in the rice fields, washing clothes, etc. De la Rosa’s style has never changed despite his exposure to Europe. In 1937, De la Rosa’s ever faithful wife, Gorgonio, died of cancer. Sadness seemed to follow the old master. De la Rosa himself lived less than a year afterwards, suffering from kidney disease. He died on December 14, 1938 in his home at the Kraut Apartments at Maria Carpena St.in Quiapo, Manila.